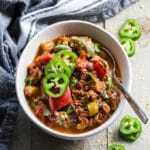 Instant Pot Spicy Vegan Chili is hearty, flavourful and comes together in less than an hour. It’s loaded with vegetarian taco meat, as well as black beans and peppers, so you get a dose of fibre with a spicy kick! Grease the Instant Pot insert with cooking spray. Turn on the Instant Pot and select sauté and adjust the time to 8 minutes. Add the oil and let the Instant Pot heat up for 45-60 seconds. Add the crumbled walnut and mushroom mixture, along with the rest of the vegetarian taco meat ingredients to the Instant Pot and stir to combine. Cook for the remainder of the time selected, stirring constantly to ensure the taco meat does not burn (see note). Add in the remaining chili ingredients and stir to combine. Select the chili/bean option and cook on high pressure for 18 minutes. Vent for a quick release of pressure. Serve with sliced jalapeños, fresh cilantro or chopped avocado. Store any leftovers in an airtight container in the fridge and enjoy within 3-4 days. The taco meat may burn on to the pot a little bit, but in my experience, the insert comes clean after soaking in a little soapy water. To prevent excessive burning, spray the Instant Pot insert with cooking spray in addition to adding extra virgin olive oil before cooking. Stirring the meat constantly while it sautés will also help prevent burning. This chili only cooks for 18 minutes on high pressure. This amount of time ensures that the vegetables don’t over-cook. If you prefer your veggies a little softer, you can always cook the chili a little longer, up to 25 minutes. To prevent the chili from turning out watery, it’s important to drain the liquid from the can of diced tomatoes. This recipe was inspired by Pinch of Yum’s recipes for Cauliflower Walnut Taco Meat and Instant Pot Pumpkin Walnut Chili.